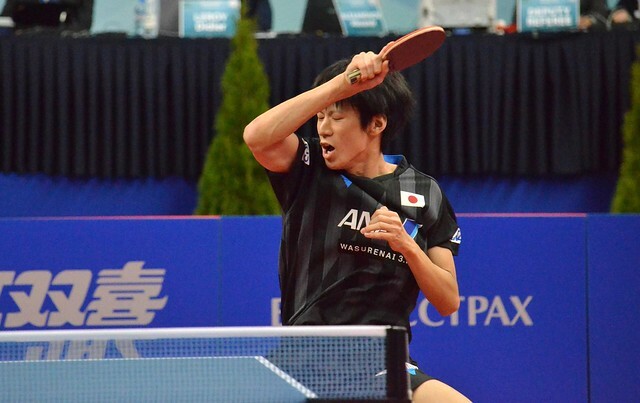 Striving to move to the next level, aiming to be selected for the most prestigious tournaments on planet earth; on Friday 16th November, Japan’s Shunsuke Togami caused the biggest upset in the second round of the Men’s Singles event at the 2018 ITTF Challenge Belgosstrakh Belarus Open in Minsk. Required to compete in the two day qualification tournament, the 17 year old accounted for Ukraine’s Kou Lei, the top seed, emerging successful in six games (11-7, 11-3, 11-9, 7-11, 7-11, 11-9). In age group events Shunsuke Togami has enjoyed notable success; last month at the 2018 ITTF Challenge Series Belgium Open, in the Men’s Singles event he departed proceedings in the qualification tournament but progressed to successfully defend his Under 21 Men’s Singles title. Notably on the ITTF World Junior Circuit, in 2016 in Hong Kong, he won the Cadet Boys’ Singles title, last year in Sweden he was crowned Junior Boys’ Singles champion. Now can the win over Kou Lei spur the teenager to similar success in the Men’s Singles event in Minsk and at senior level in 2019? Success against the odds for Shunsuke Togami, as play in the top half of the draw progressed, there was also success for colleague, Yuki Matsuyama contrary to expectations; the no.24 seed, he accounted for Frenchman, Alexandre Robinot, the no.7 seed (11-6, 8-11, 7-11, 11-9, 12-10, 11-7). However, there were defeats for players from the Land of the Rising Sun; most notably Sweden’s Elias Ranefur ended the progress of Yuta Tanaka (5-11, 14-12, 11-8, 11-9, 11-6), Iran’s Nima Alamian, the no.3 seed, overcame Masaki Takami, the no.26 seed (11-13, 12-14, 11-3, 11-9, 11-6, 13-11). A fine effort from Elias Ranefur, it was the same from colleague Simon Ardvisson, as it was from Belgium’s Robin Devos and Romania’s Cristian Pletea. The journey starting in the qualification tournament, Simon Ardvisson overcame Martin Allegro, like Robin Devos from Belgium (11-8, 6-11, 11-3, 10-12, 11-6, 11-9). Meanwhile, Cristian Pletea, the no.23 seed, halted the progress of Ukraine’s Oleksandr Didukh (11-6, 5-11, 11-5, 11-8, 11-7); Robin Devos, the no.8 seed, accounted for India’s Manav Vikash Thakkar (11-3, 13-11, 15-13, 12-10). Progress for visitors and there was progress for the host nation; Pavel Platonov, the no.14 seed, beat Russia’s Denis Ivonin (11-7, 11-4, 11-8, 11-7). Both the third round and quarter-finals of the Men’s Singles event will be played on Saturday 17th November.